Jo Ann Anderson, 85, of Bakersfield, passed away March 18, 2019 at Mercy Hospital Downtown. Born Jo Ann Jones on August 6, 1933 in Seminole, OK. She was devoted to her family and was proud of each and every one of them. Jo Ann was preceded in death by Jackie R. Jones whom she was married to for 41 years. 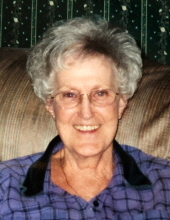 Jo Ann was from a family of 11 and is survived by 5 siblings: Zelma, Billy, Norma, Mary, and Don; 5 children: Brenda and Stan Tangeman, Pamela and Ted Cummings, Tommy and LaDonna Jones Womack, Stacy and Ron Baize, Leann and Jay Kenley; 14 grandchildren, 17 great grandchildren, and 1 great-great grandchild. Jo Ann was a long time member at Rosedale Church of Christ. She also loved politics (Go Trump) and keeping up on current events. She enjoyed spending time with her family, going on Facebook, playing canasta and dominoes. She was proud to be an American and always supported veterans. Jo Ann will be deeply missed by those who knew and loved her. To send flowers or a remembrance gift to the family of Jo Ann Jones, please visit our Tribute Store. "Email Address" would like to share the life celebration of Jo Ann Jones. Click on the "link" to go to share a favorite memory or leave a condolence message for the family.